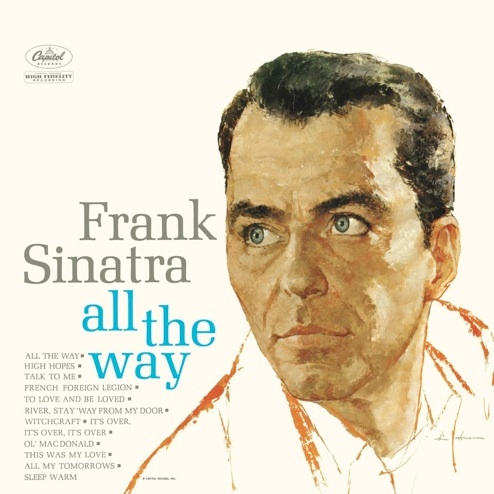 All the Way is Capitol’s fourth compilation of Sinatra singles, recorded May 20, 1957 - September 1, 1960, released in mono and stereo on March 13, 1961, possibly thrust upon the market at that particular time specifically to compete with the release of Sinatra’s first Reprise product, Ring-a-Ding Ding, which was also scheduled for a March release, but ultimately got pushed back to April 3 due to a cover art snafu. 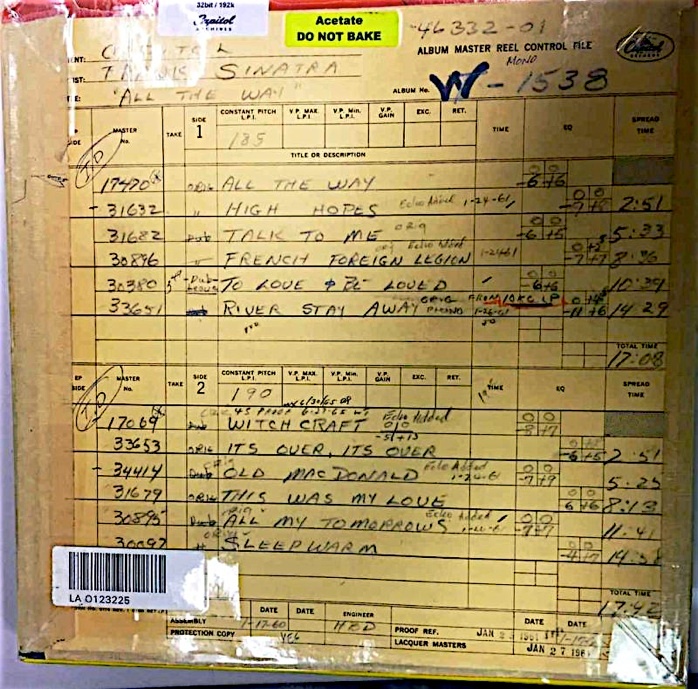 From a recording standpoint, the album, much like This is Sinatra, Volume Two before it, spans multiple technological advances at Capitol studios. Two songs were recorded “mono only” in 1957, and thus appeared in “enhanced monophonic sound” (pre-Duophonic “fake stereo”) on the stereo All the Way album; one song was recorded when Capitol was running separate mic arrays and tape formats for mono and stereo; eight were recorded after Capitol had switched to full-time recording on 3-track tape for stereo and mono use. At least three of the tracks were released originally on 78 RPM disks in North America, at the tail-end of Capitol’s involvement with that format, and all of them appeared as 45s, although “To Love and Be Loved” was a longer, alternate take on the LP, and one track also appeared on the highly unusual (for the time) Stereo EP format. What’s the Best-Sounding Full-Length, Original-Running-Order Release? Disclaimer: This is clearly a way to calculate “rough” qualitative number for each releases as a whole. It’s not perfect, but serves to give some idea of how one release compares to another. Ponder those numbers for a moment. Even the top-scoring releases are only in the 3 to 3.5 range on a scale of 1 to 5, meaning that as a set, when all is said and done, the set is only slightly above average in its best masterings, and one could, both in theory and practice, assemble their own compilation from assorted, available sources, and have “top choice” tracks across the board. (Frankly, in this day and age, that seems like a pretty good idea to me.) No All the Way release has more than three songs that scored a “top choice” rating, meaning that even on the BEST editions, 9 out of 12 tracks can be found better somewhere else. Why such inconsistency? It’s actually fairly logical. Some tracks have great mono mixes; some tracks have poorly done mono mixes. Some tracks were mixed well for stereo in 1961; some had poor stereo mixes made in 1961; some had great CD-era remixes; some did not; some had much better stereo mixes only on other, later (non-All the Way) compilations; and some “stereo” All the Way releases also contain fake stereo tracks, which dropped their numerical score, of course. It’s not noted as such, but the 1988 CD is the only release sampled that has zero tracks whose mastering scored an “avoid” rating, although it also has eight tracks that scored “average” and 1 that was “sub-par.” Regardless, it’s probably the best choice overall. Of the five original Capitol/Sinatra singles compilation albums released 1956-1962, this is the only one that always maintained its full-length tracklist, never being abridged by Capitol. The mono LP was generally available from 1961 to about 1968, and was reissued by EMI in Holland in 1984 and again by UMe/Capitol in 2016, a move that surprised some fans, myself included. The mono LP version has never had an official digital release. The stereo LP was also generally available from about 1961-1968, then returned to print in the USA from 1976 through roughly the time that CDs entered the picture, including an “audiophile” reissue in the 16-LP boxed set from Mobile Fidelity Sound Lab in 1983. On each of these editions (and on others around the world), “All the Way” and “Witchcraft” typically appeared in “enhanced monophonic sound.” The 1984 UK and Dutch stereo LPs, for the first time, included those two songs in true mono, with the remaining ten songs in stereo, a pattern that was repeated for the 1988 debut of the album on CD, although that 1988 CD contained the ten stereo songs not in their original stereo mixes, but in newly-created stereo remixes, with generally good results. Ten years later, in 1998, EMI in the UK included the complete album within their 21-CD The Capitol Years boxed set, with the two mono tracks in (heavily compressed) mono, and the ten stereo tracks in their original stereo mixes. 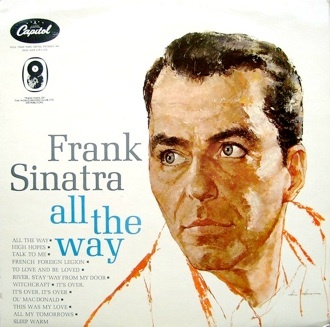 Upper Left: In Australia, the album appeared in two unusual variants: sometimes reissued with alternate artwork, sometimes retitled Sinatra Sings Music for Pleasure, using the same title and cover art as an earlier compilation that bore no resemblance to the All the Way album, in terms of content. Near Left: EMI’s World Record Club released a version in 1966 (available in mono and stereo) that contained all twelve tracks, but with a jumbled running order. The “mono” version of this album did not use the actual mono mixes, but was a fold-down to mono from the stereo tapes. For information regarding cover art variations, click here. First off, it’s a good sounding mastering, generally speaking. Secondly, remember, be it by accident or some other reason, virtually all* stereo editions of the All the Way album have the stereo image reversed, with the strings on the right side. The only* way to hear the All the Way album with the stereo image corrected is on the 1984 UK and Dutch stereo LPs. Fake stereo tracks aside, to my ears, the 1976 SM-series LP sounds very nice, too, as does the 1983 MFSL LP. For mono, I think the 1984 Dutch DMM LP is in a league of its own. By the numbers, though, the 1988 CD is the best-sounding release this compilation album has had, and I don’t really have a an especially compelling argument to the contrary.